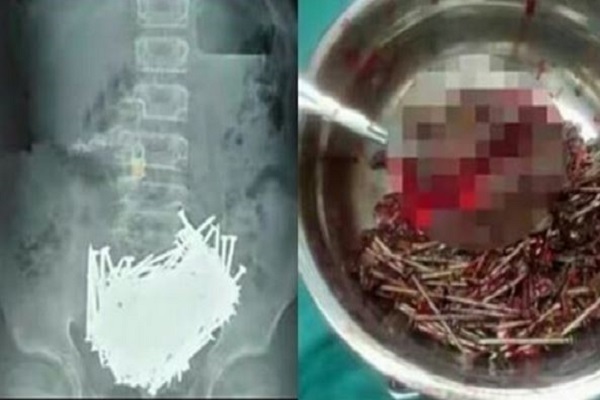 The doctors in Calcutta Medical College Hospital on Monday removed more than 600 iron nails from a mentally challenged person’s stomach. After 24 Hours of Surgery Doctors Says the operation was successful and the patient is in the stable condition. As per Patient Family Members, he was admitted to the hospital after suffering from seviour stomach pain from past few months. A USG test on the patient found that a lot of nails were piled in his stomach. “He is mentally disbalanced and has a habit of swallowing strange things. But we never imagined that there would be so many nails on his stomach,” a relative of the patient said. The X-ray and CT scan of the abdomen showed rusted iron nails in his stomach and few of them in the liver. The nail piece in the liver had pierced the wall of the stomach and entered into the liver. Claiming the operation to be a risky one, surgeon Siddhartha Biswas, who headed the medical team, said the patient was now out of danger as the nails did not pierce or injure his stomach in any way in spite of being inside for days. The Doctors Said We cut his stomach and used a magnet to bring out the nails one by one. There were more than 600 nails inside. It was made sure that all the nails he swallowed, were taken out,” he added.The size of the nails was 2 cm each, to be precise. The surgery was performed on October 29. The boy was discharged from the hospital and he is back to normal diet.